It made me wonder. What did Mr F.C. Coath write? Did he, at that point in time, know where his son was buried and how he had met his fate? Who was his son? Apart from the family name ‘Coath’, I had nothing else to go on. So I started to look up war memorials in Smallfield, then Horley. I soon learnt that there is a war memorial at St Bartholomew Church in Horley. But it seems that not all the names of war dead were inscribed on the memorial or on the Horley Parish Memorial Board; indeed, it appears that only those who had fallen in the Great War had had that honour. All I could find out was that 45 men from Horley had served. And of the 45, none had returned home. So I decided to try the Commonwealth War Graves Commission. However, there were 16 men with the family name ‘Coath.’ Focusing only on those whose grave/memorial was located in Southeast Asia – I came across Corporal Reginald France Coath, buried and commemorated at Chungkai War Memorial, near Kanchanaburi in Thailand (see picture). I thought, surely, this could be the son of ‘F.C. Coath Esq.’ as mentioned in the letter? Corporal R.F. Coath was with the Bedfordshire and Hertfordshire Regiment. A search for this regiment revealed that this regiment “served with 55th Infantry Brigade, 18th (East Anglian) Infantry Division. After home defence duties in Britain they were deployed as reinforcements to Malaya in early 1942. 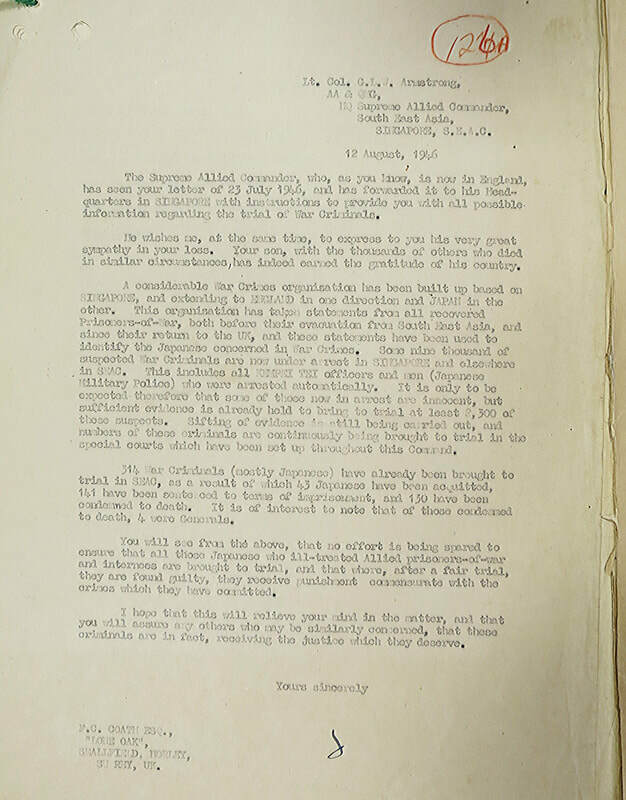 The battalion surrendered to the Imperial Japanese Army at the Fall of Singapore and the men were held as POWs for the rest of the war.” This all seemed to fit. Corporal Reginald France Coath (service number 5953025) died on 26 January 1944, aged 27, somewhere along the Burma-Thai Railway line, which spanned Nlong Pladuk in Thailand and Thanbyuzayat in Burma (Myanmar). (I didn't find out where exactly.) 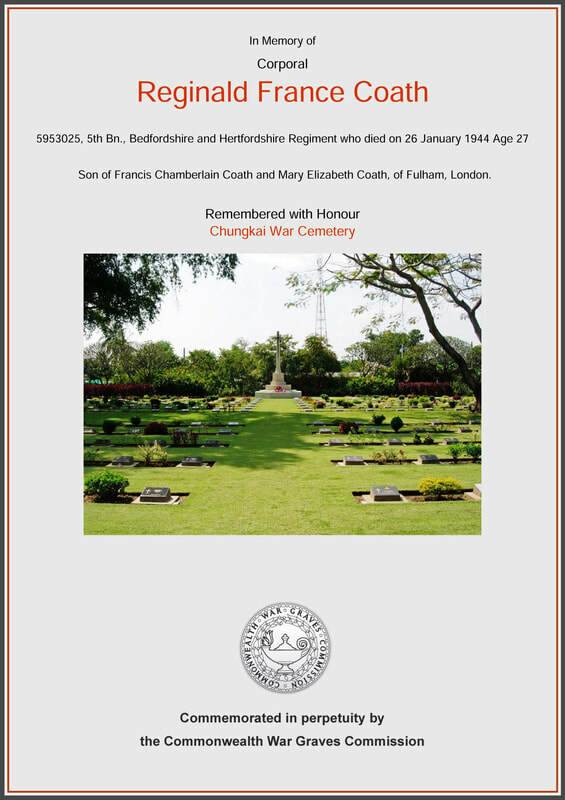 He is buried at Chungkai cemetery in Thailand, plot III, row E.
​Was still mulling over the Coath family and found a thread online and learnt that R.F. Coath had an elder brother by the name of John Henry Coath who was born in Fulham. So I'm thinking, maybe Horley was a temporary address? Maybe the family had moved out of London during the war years and later returned to the family home in Fulham? This led me to looking up a genealogy site for Francis Chamberlain Coath. 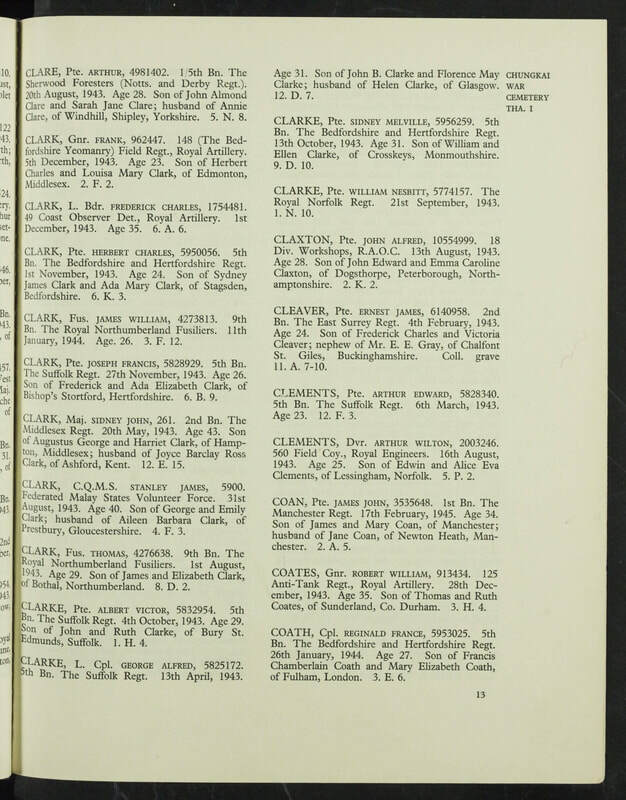 And here's what I've learnt -- Mr Francis C. Coath was born 1881 in Fulham, baptised in St Barnabas Pimlico in 1882 (interesting side fact -- the church was built in 1866, so it was still fairly new-ish when Francis was baptised there), possibly married twice (in 1903 and 1909), and died in 1965. It appears that he may also served in the Great War and was in the armed forces from 1914-1920. 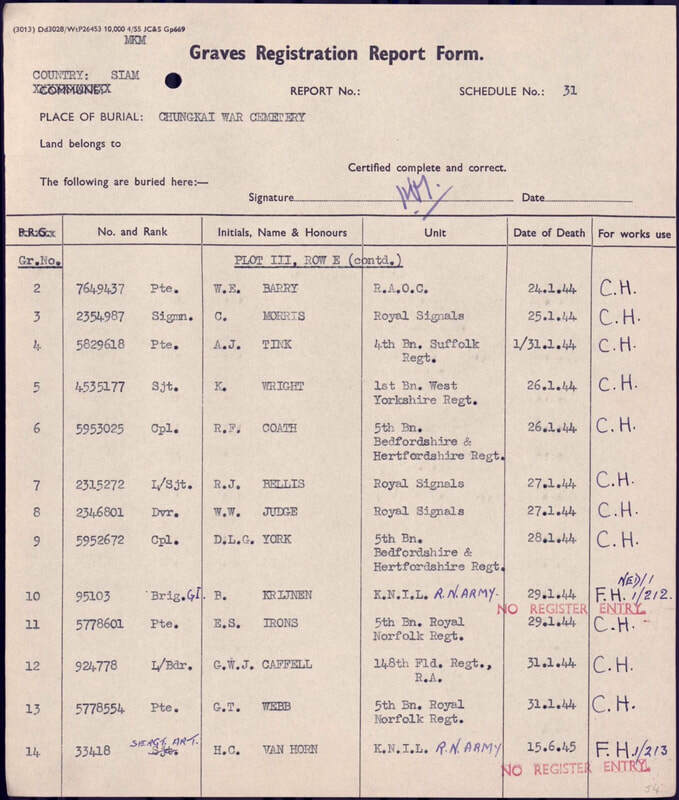 Searching Forces War Records, there was only one match for Francis C. Coath -- Rank: Private (Service number: 446001), Regiment: London, Battalion: 10th (County of London) Battalion (Hackney), 58th Division. This unit was involved in the landing at Suvla Bay in 1915 in the Battle of Gallipolli and saw action in the Middle East, from the invasion of Palestine, victory in Gaza, to the Sinai. Francis C. Coath suffered a gun shot wound on 21 September 1918, three days before armistice and demobilisation on 24 September 1918.